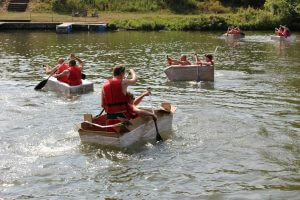 Teambuilding Pappboot Regatta: Team event ideas with fun factor! Team building ideas and company outing, the cardboard boat team event … a snapshot: We have rarely laughed so much as on this day. Above all, we have learned to know and understand each other much better. And we needed nothing more than cardboard, foils, tape and this simple, great teambuilding idea! “A bright blue sky, a sparkling sparkling lake. But what was that – in front of us on the meadow? Stack of boxes, foils and tapes! “We should build Cardboard Boats from this?” Asks the team assistant in disbelief. To discuss drafts and find solutions only minutes later with purchasing and accounting professionals. Basel, Munich, Stuttgart, Frankfurt, … all over Germany! We will come to you! 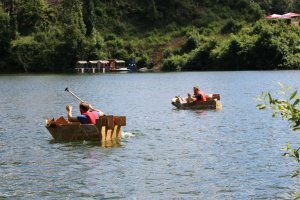 Experience your own team building Cardboard Boat Event, go for a company outing. … It was team building in the truest sense of the word! The older ones went to work with calm and experience, the younger ones with a stormy élan. Emsig built team red from authorized officer, warehousemen and trainees a catamaran. At Team Blau a canoe was created, Team Gelb’s Titanic reminded more of a bathtub. Let’s go into the water with it: Two men in a boat! And splash: Team Green with the master as helmsman immediately went swimming with his cardboard boat. Great hoot ashore! Gradually, all the others test the cardboard boat and see that the constructions swim. After the extensive durability test starts the race, the regatta. The teams deliver a thrilling race and are cheered frenetically ashore. “Forward, forward, Rooot, hey, hey hey, blue ahead, hey!” And, yes – the cardboard artworks are indeed driving! We, Team Red, are proud of our boat! Even if it was only second and came rather as a submarine to the finish: actually there were only winners. It was great fun for all colleagues. We have rarely laughed so much as on this day. Above all, we have learned to know and understand each other much better. And we needed nothing more than cardboard, foils, tape and this simple, great team building idea! Team building with incentive character: Request a proposal now!